Nutrition needs are one of the most important factors to help your cat live a long healthy life. Studies indicate our feline housemates have a serious weight problem. Ten to fifteen percent of the American cats are overweight, while 40% percent of the cats are considered obese. Being overweight or obese aggravates your cats arthritis, increases diabetes, places an extra burden on their heart and decreases their lifespan. Cats are carnivores and have different nutritional needs than dogs or people. In nature, cats are hunters. They consume their prey which is high in protein, with moderate amounts of fat, and small amounts of carbohydrates. The vitamin and mineral requirements for cats are different from humans and dogs. Making your own homemade diet for your cat, may be a difficult and time consuming undertaking. You will need to meet the protein, fat, carbohydrate, vitamin and mineral requirements need for your cat’s health. Commercial food comes as dry, semi-moist, or canned. Cat foods are manufactured for different life stages (kittens, adults, seniors, and pregnant or lactating queens). All the cat foods sold should state that it meets AAFCO standards. This means the cat food contains the needed amounts of protein, fat, carbohydrates, vitamins and minerals to meet the nutritional requirements appropriate for a your cat’s age. If your cat has a specific health problem, he may need a prescription diet to help manage the disease problem. The prescription is available from your veterinarian. Commercial diets will differ in water content, protein level, calorie density, taste and digestibility depending on if they are dry, semi moist, or canned. The amount of food and the number of times you feed your kitten will depend on his the age and activity level. Growing kittens will need more food than active adult cats or sedentary feline senior citizens. Growing kittens will need a measured amount of food three times a day, while their adult feline housemates need a measured amount of food once or twice daily to maintain a healthy weight. In multiple cat households, you should offer measured amounts of food to the cats twice daily for 15 to 30 minutes. Some cats, in multiple cat household, feel less threatened, more secure and happier if fed in a room by themselves. Cats by nature feel more comfortable in a quiet, safe, secure place. The view of other cats, the noise of washing machines, dishwashers, children running around or the family dog barking may distract him from eating. By offering your cat/cats measured amounts of food at set times, you can see which cat is eating and how much each cat is eating. 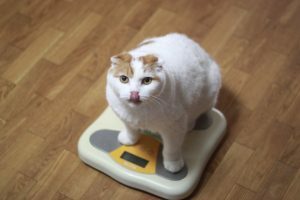 This will help you maintain each cat’s optimal weight. Lack of appetite may alert you to possible health issues. Call the office at (559) 432-0887 to schedule a consultation .